We are excited to proudly highlight a different employee each month to offer an inside look into the culture and community that make up The Sembler Company. Learn more about Sembler and the people who have found a home here through our spotlight employee interviews! This month, it is JP Guzzardo. Chelsea Rogers, Director of Marketing: What has been your favorite part about working at The Sembler Company? JP Guzzardo, VP of Development: The overall culture. It’s a very good group of people that are very good at what they do. It’s a team environment and I learn something new every day. Chelsea Rogers: What does your workspace look like? Are you organized/messy? JP Guzzardo: Depends on the day. Typically, I am pretty well organized. I am a “list person” as well so I start most days off with a list of task that I will work on for the day. Unfortunately, I have been a slow adapter to the paperless workspace. Chelsea Rogers: What is your role at The Sembler Company and when did you start working here? 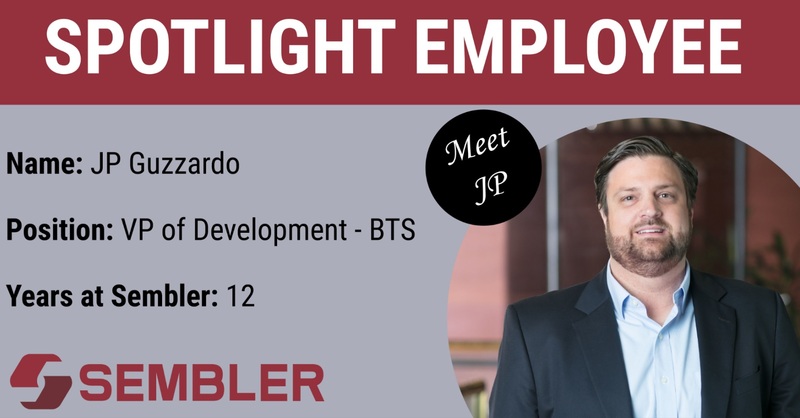 JP Guzzardo: I have been working at The Sembler Company for 12 years and I am Vice President of Development and I run our Build to Suit division. With that said, we are all utility players here at The Sembler Company, so I work on a variety of projects. Chelsea Rogers: What was your first job? JP Guzzardo: The first job I remember really being paid for was from my uncle. He had a chain of washeterias and had to upgrade his sewer systems in 6 locations. So one summer, my cousin and I were plumber assistants….I was about 12 years old. For 8 weeks, 6 days a week, 10 hour days a day, we worked digging drainage pits. They were about 4 foot tall, 28 inches wide and ran 40-50 feet. We dug dozens of them. I did the math and I made about $3.00 an hour. I am certain a bunch of OSHA and child labor laws were violated. Chelsea Rogers: What’s your favorite movie/TV Show? Chelsea Rogers: If you could meet anyone, living or dead, who would you meet?